I’ve come to realize that I have some work to do on my biscuit-making skills. I absolutely love biscuits. Flaky, hefty biscuits. Mine…are neither. They tend to turn out horribly flat. 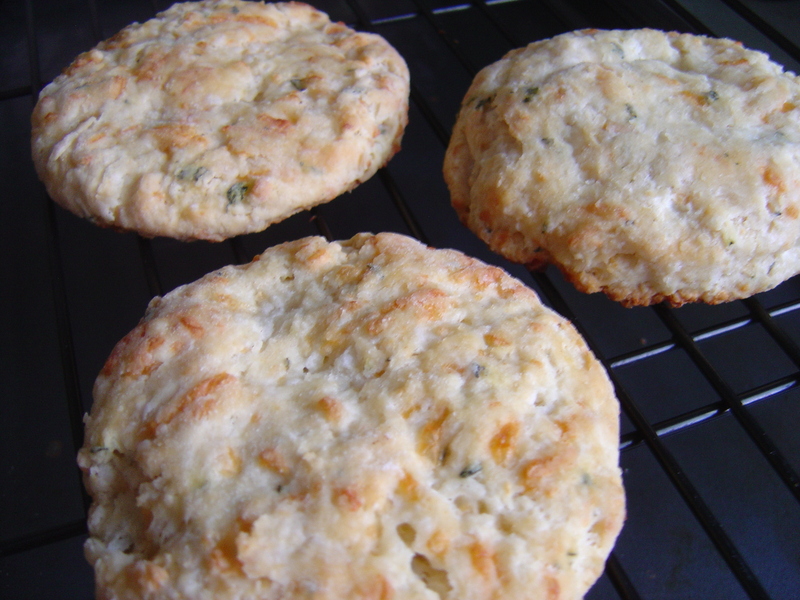 These thyme and cheddar biscuits, however, weren’t like lead weights like my last ones were, but they never got the rise I was hoping for. Again. No matter how cold the butter or how fresh the baking powder or how little I work the dough, my biscuits turn out flat. And I’m not OK with that. Eventually, I will find my perfect biscuit recipe. In fact, I’d love to hear from you if you’ve got a great, tried and true biscuit recipe (no shortening please!) that you’d like to share with me. Flatness aside, these biscuits were tasty!! The thyme really comes through here and if you’re a lover of thyme like I am, you’ll definitely appreciate this recipe. The cheese adds a little something extra but isn’t at all overpowering – a perfect compliment to the thyme. I paired the biscuits with a recent batch of my favorite soup du jour but you could make them with any main course or for breakfast as a biscuit sandwich or for biscuits and gravy. Combine the flour, baking powder, salt, and sugar in the bowl of an electric mixer fitted with the paddle attachment. Add the butter and mix on low speed until the butter is the size of peas. With the mixer on low, add the half-and-half and beat until just mixed. Add the thyme and cheese and mix until just combined. Dump the dough out on a well-floured board and knead lightly into a rectangle 3/4-inch thick. Cut out rounds with a 2 1/2-inch round cutter and place on a sheet pan lined with parchment paper. Brush with the egg wash.
Bake for 20 to 22 minutes, until the tops are browned and the insides are firm. Serve warm. These look awesome! They look like they are from a restuarant. I don’t think they are too flat at all! These do look and sound great! 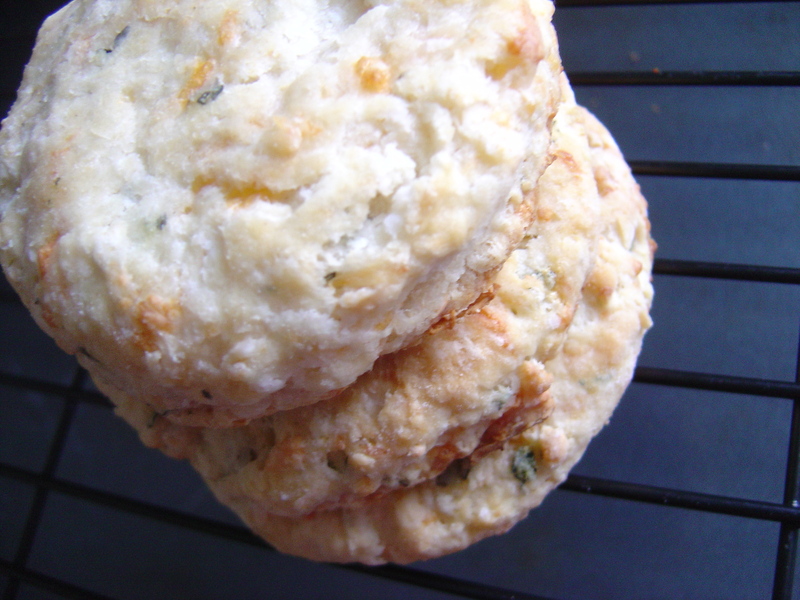 My go-to biscuit recipe is the buttermilk biscuits in Joy of Cooking. One thing you might check is the expiration on your baking powder. It only lasts 6-12 months after it’s opened, depending on how it’s stored. This looks delicious and I’m sure flavorful too! These sound wonderful. Thyme is one of my faves. Ill have to remember this when I have soup next. Biscuits are not my forte either, but rolling them to thin can make the difference. Yours look delicious! I already copied the recipe! Looks delicious! I made these today using thyme left over from making french onion soup. And I was so suprised, these might be the best batch of biscuits I have ever made. Very easy and came out just right. Oh the yummy flakey goodness!